NEWPORT NEWS, Va., Sept. 21, 2015 (GLOBE NEWSWIRE) -- Huntington Ingalls Industries (NYSE:HII) announced today that its Newport News Shipbuilding division collected more than 15,000 school items for Hampton Roads students through its annual "School Tools" drive. 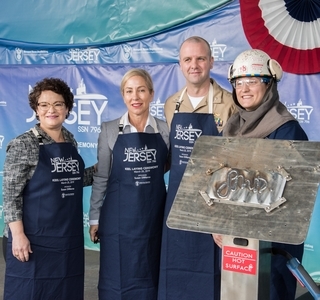 "We are members of the community as much as we are shipbuilders," said Tom Cosgrove, Newport News' manager of corporate citizenship. "We know that today's students are our future shipbuilders and leaders. As a company, Newport News Shipbuilding values education and improving the lives of youth to help them realize their full potential. School Tools is one way that we will enhance the education of thousands of students this year." Newport News employees donated, sorted and distributed a variety of school supplies for the drive, including 5,076 pencils and 689 packs of paper. The supplies were delivered on Sept. 10 to the social services departments of Newport News, Hampton and York County and to the Boys & Girls Clubs of the Virginia Peninsula. "We are so thankful for the wonderful generosity from Newport News Shipbuilding," said Hal Smith, deputy director and chief operations officer of the Boys & Girls Clubs of the Virginia Peninsula. "These school supplies will enable our kids to start the school year off right and put them on the path to academic success."